I am so excited to be sharing pictures of our chicken house today... mostly because it means we are finally in the final stages of completion. It seems like we have been working on it for months, and really, I guess we have been! It all started back in January with an ugly shed that was on the property when we bought our house. Ugly it may have been, but it was the only outbuilding and we were thankful for the storage it provided. Justus sketched up a plan that included it as the main structure with a chicken house on one side and (eventually) another storage lean-to on the other side. Justus located the perfect spot in our yard for the chickens... shade the majority of the day, a nice breeze and good drainage. That meant we had to move the shed, which took the two of us working together about five solid hours. Once the shed had been moved, we then painted it white. I'll never forget that day... although I usually do the painting, Justus took pity on me since it was drizzling rain... we snuggled into hats, gloves and jackets and worked away. In February, construction on the chicken house began. In March, the building was still coming along, although Justus was only able to work on it during the weekends and half the time it seemed like it rained. Still, it was exciting to see progress. Justus used pine planks that were scraps from my parents' ceiling in the house they are building. The boards were warped and not in a condition they could use them, but just perfect for an exterior chicken house. The entire house itself is made out of these pine planks, and although we eventually painted the outside, we left the interior in this natural state. The end of March, Justus built the door to the house, which is still my favorite feature. It is large, heavy and fits the aesthetic of the house perfectly. This was the last before picture I have. About this time, I stopped taking pictures as then it was time for me to start painting and Justus began constructing the run that is attached to the house. I took these pictures early this morning as the sun was rising. To say that we are excited this project is almost complete is an understatement. This is the view I have from our kitchen window, and I can't help but look out at it throughout the day. This weekend we got to hang the sign I've been waiting to hang for a couple months now. My mom surprised me with this sign that she painted back in February and gave our chicken house the perfect name. I laughed when she gave it to me... it was just so fitting (smile). This is the side view... as you can see, the house is on the right and the run takes up the rest of the space. We close the chicks in the house at night and open the little door to the run first thing in the morning. I think the most rewarding part is to see how much they love it. They come flying out with happy chirps. When they are a little older, I will let them out to roam around the yard, but for now it's a safe place for them and also a way for them to still be outside when we aren't home. Justus poured concrete around the bottom of the run so that no predators can easily enter. I'd like to plant about eight boxwood around the side and even build a little bench to set here some day. This weekend Justus used bricks from the original chimney of our home for a little landing in front of the screen door to the run. We also planted two tiny little boxwood with dreams of them being lush and full one day. We used 1x1 heavy gauge wire instead of chicken wire. I felt that it was more durable, but I will give fair warning... it does not stretch easily. Justus stretched it as much as he could and we just had to call it good. We replaced the door hardware to the shed so it matched the barn hardware on the chicken house and installed a barn light. The biggest expense was purchasing green metal roofing that matched the roof of our house... we considered galvanized, but we both love the cohesive look it gives our property. The chicks are growing by leaps and bounds and seem healthy and happy. We enjoy them so much already and I find myself going out to the chicken house several times during the day just to check on them and say hello. Sometime this fall Justus will begin construction on the other side of the shed for his storage building. There's still some landscaping and little things to finish, but we're all so happy to be at this stage... enjoying spring days with our chicks. I'll share pictures of the interior in a future post! I love this time of year that brings so many familiar and well loved sights and smells. Now that the days are longer, evenings outside together are my favorite. The garden is growing (little plants and huge weeds) and the lavender is in bloom. Scents of honeysuckle drift through on the breeze. Yes, our mama finally brought her four kittens down from the tree where she had them. I haven't introduced you to Freckles yet... she's a stray that adopted us and I was never sure if she was going to stay for good. But she's become a permanent resident now for several months and is so sweet and gentle. Have a wonderful weekend and Memorial Day! I hope you had a wonderful Saturday! This past week flew by in a hurry, but a highlight was getting away for a little bit to pick some fresh, local strawberries. Up until my life here in the south, I had never picked strawberries; several years ago my mom was visiting us and had heard about a local patch. So off we went one morning and we were utterly amazed by the rows and rows of strawberries... so juicy and sweet we gobbled as many as we could while filling our buckets. Since then we try to go every year, but it still feels like a novelty every time. The first time Jillian went to the strawberry patch, she was a tiny little newborn asleep in the stroller. Now she's old enough to fill almost an entire bucket by herself. We all had so much fun. By the time we were finished, the girls were tired and full with strawberries. I had to include this picture, because Rosetta was absolutely covered in strawberry juice! I came home with three gallons of strawberries and then wondered what I had been thinking and when I was going to have enough time to do something with all of them before they went bad! This week we've had strawberries in oatmeal, on pancakes, in salad and straight out of the bucket. And every chance I've had I've canned a small batch of strawberry jam. I made some regular strawberry jam with pectin, but I've been wanting to try to make some jam without. I had also been wanting to try some jam with honey instead of sugar, but I was nervous that it would taste too much like honey, so I compromised and did both. I made a very small batch and played around a little with ingredients and the result was a preserve-like jam that was delicious and full of flavor... it ended up being my favorite and I canned another batch again last night. The jam isn't quite as set as one made with pectin, but I was still very happy with its texture. Canning is something I am still learning, but I really enjoy the process. I don't have anything fancy in the way of canning equipment and I like to do it in small batches... I suppose I feel like it's a little more manageable... or that if I mess up, it won't be too many jars (smile)! But despite the learning curve, it is so worth it... there really isn't anything better than homemade strawberry jam. Chop strawberries and combine with sugar and vanilla extract. Let the strawberry mixture sit in a bowl while you prepare your jars and lids. Pour strawberry mixture into a large pot and add honey. I actually mashed my strawberries a bit at this point, but I should probably tell you to do it beforehand because the pan gets hot! Bring to a rolling boil over high heat, add lemon juice and zest and continue to boil until the jam is ready (my thermometer broke, so I did a spoon test, but it should be ready at 220 degrees). Remove from heat and ladle into the prepared jars. Wipe the rims of the jars, apply lids and rings and process for 10 minutes. Have any of you tried making jam without sugar and honey instead? I'd love to hear about it! P.S. The winner of the Shabby Apple giveaway is Judy. Thanks for entering! Happy Mother's Day! I hope your day has been wonderful! The last few weeks we've had a lot of rain, which has meant slow progress on outdoor projects, but we have gotten a few things accomplished in the kitchen. Recently Justus built a cabinet to enclose our refrigerator. I was particularly excited about this, since it means we're one step closer to additional countertop space (yay! ), but it also helped our kitchen look a little more cohesive over in this corner. Our kitchen isn't necessarily small, just awkward. When we bought our house, we moved our refrigerator all over, but because of doorways and walkways, this was really the only place for it. So it sat freestanding like this the past few years. After Justus completed the framing, he installed these pine tongue-and-groove planks, which (lucky for us) were scrap pieces from my parent's ceiling. They had a lot of planks they couldn't use or were leftover scraps, but they've been perfect for little projects here and there. We've had our fridge for nine years now and it's still going strong, so I'll doubt we'll replace it anytime soon, but we were sure to build the cabinet with standard dimensions so that another fridge would easily fit in this space. After the planks were installed, Justus then trimmed out the cabinet. I sanded (and sanded) and filled with putty between the trim pieces before painting so that the trim looked a little more smooth and more like one unit. Eventually our farmhouse table will move out and Justus will build a lower cabinet for this space so we can extend the countertop to the new refrigerator wall. I have to admit too that it's really nice not looking over and seeing all that black that was the side of the refrigerator. I really wanted an open shelf above the refrigerator for extra storage. For a couple weeks I puzzled over what kind of storage baskets to put on the upper shelf. I even looked at some larger baskets online and then this week I remembered that Justus had made a passing comment about using the vintage locker baskets we had. At first I placed two on the shelf, which didn't look right, and then I remembered I actually had another one sitting empty upstairs... and it was a perfect fit. It almost looks like we built the shelf to fit these three baskets! Justus built a little lip with the trim in front of the shelf so that the baskets easily come out, but won't fall off the edge. I couldn't resist adding this picture in. While I was taking these pictures this afternoon, Justus was playing outside with the girls. I heard the screen door slam and Rosetta proceeded to come in, climb onto the chair I had been using, stand in front of the camera, and say, "Cheeeese"! 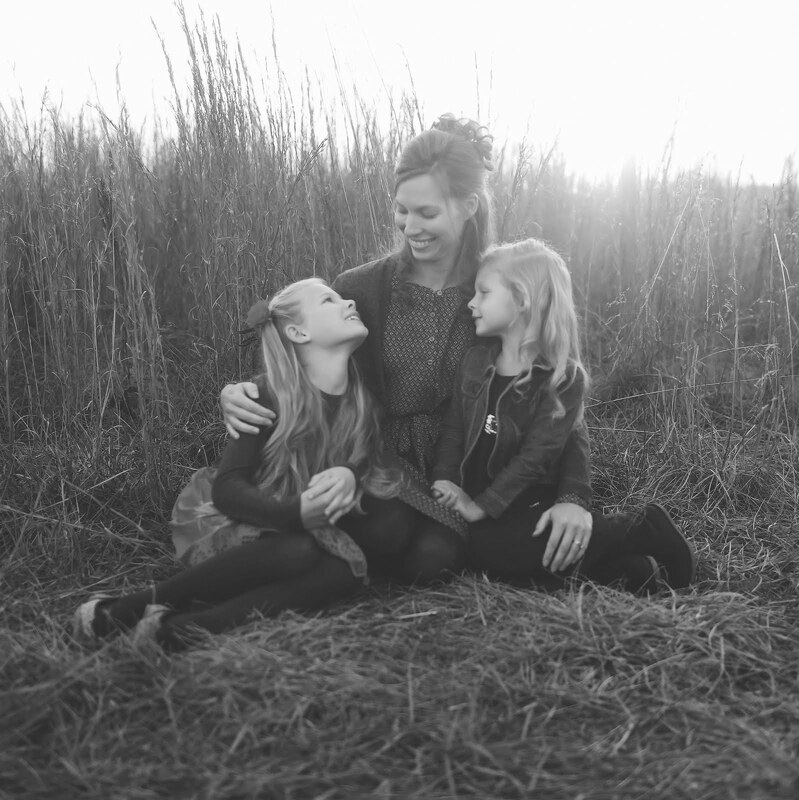 There is not a second that goes by that I am not thankful to be a mother to our two precious girls. Ten perfect, precious little chicks. Needless to say, it has been a very exciting day for the girls. Jillian hasn't wanted to leave their sides for one second... these cute little yellow ones are her favorite. Of course we had to take them outside this evening for a little photo shoot! These will (hopefully) all be laying hens and they are all Heritage Breeds. I was going to place our order online, but several of the breeds we wanted were back-ordered. I then called our local Co-Op, who were so friendly and helpful. They placed a special order so that they would all arrive at the same time. I ordered two each of Araucana, Buff Orpington, Rhode Island Red, Barred Plymouth Rock, and Black Australorp. This sweet little one is an Araucana, who will lay colored eggs. I love that each is a little unique and I know we'll have a blast watching them grow up. Right now we're working on some names... if you have any suggestions, I'd love to hear! In the span of six months we went from zero pets to an exuberant poodle pup, a stray cat that adopted us, an indeterminable number of kittens (indeterminable as said cat had them in a tree) and now ten chicks. Such fun times!